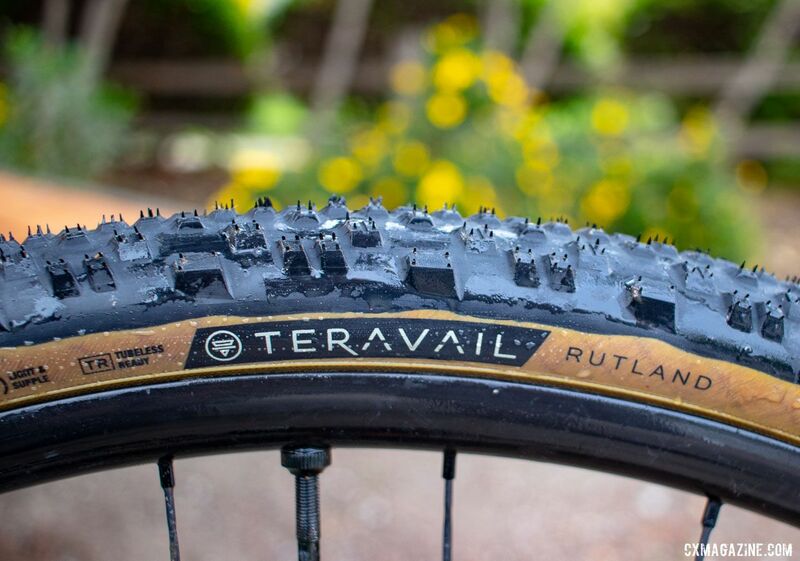 At the 2019 Sea Otter Classic, Teravail, the tire brand from QBP, showed off its latest gravel and mixed terrain tire, the Rutland. We were lucky to grab an early set before the show and offer some early photos, specs and impressions. The Rutland is targeted at cyclists who may be riding more than traditional gravel. With a pattern of medium-sized, directional knobs and well-spaced, well-supported side knobs, the Rutland is designed to tackle conditions that cause the average gravel tread to slip. Find yourself needing to scale a muddy, wet climb? Want to chase (or drop) your mountain bike buddies on singletrack? 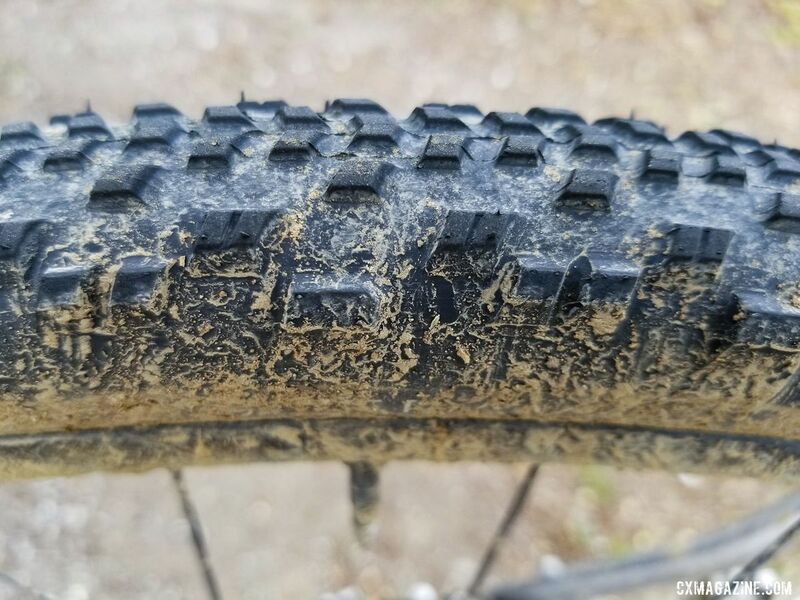 The Rutland offers plenty of grip in these conditions and allowed us to pedal up the slopes of California’s Mount Diablo when many with other gravel tires had to walk. 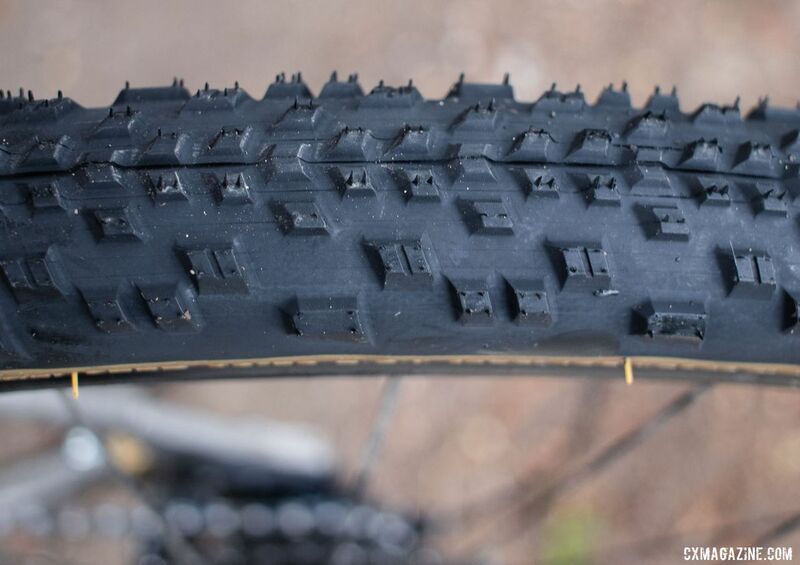 The other upside to the tread design appears to be more durability (and therefore grip) over traditional gravel tires with a small file tread. After a few unintentional skids, the tires looks no worse for wear. Think all those knobs will make you buzzed on pavement? That’s not the case. It seems to roll about as well as a WTB Nano, another popular mixed terrain option, with less buzz than a WTB Resolute (another staff favorite). The Rutland comes in an impressive number of sizes and casings. Sizes are 700c x 38, 42 and 650b x 47mm and the casings are Light and Supple, Light and Supple Tan and Durable Bead-to-Bead. We tested the 42mm version in the Light and Supple — Tan casing. Think Light and Supple is just marketing? 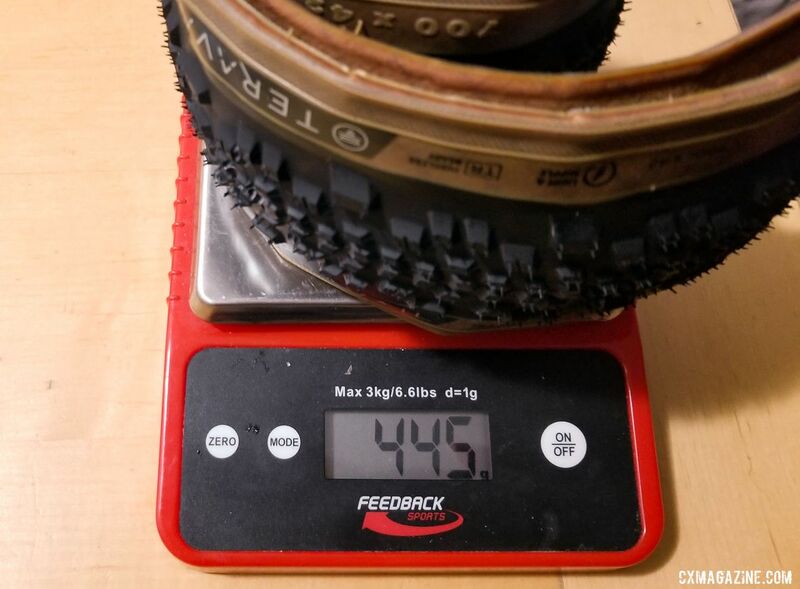 Our 42mm tire tipped the scales at 445g. That’s quite light. The Light and Supple — Tan has a list weight that is 60g lighter than the Light and Supple casing, giving you weight savings with the classic look. For comparison, 445g is few grams more than the more aggressive 38mm Ritchey Megabite and 5g lighter than the 42mm Resolute. It also offered a more supple ride than the tires it replaced, the excellent, fast-rolling 43mm Panaracer GravelKing SK. Cyclists might want a few more psi higher than they ride with a stiffer tire. Could that lightweight supple casing come at the cost of puncture protection? Only time will tell. We haven’t flatted yet. Want to turn up the volume from your 40mm gravel tires? While listed tire widths keep growing, tire companies measure their tires differently, so don’t assume this will be bigger than your tire. The 42mm Rutland measures 103mm bead-to-bead. That’s 10mm less than a 42mm Challenge Gravel Grinder and 6mm less than the Resolute. [Why we measure bead-to-bead]. That translates into a slightly narrower profile than these tires when inflated on a rim. On a 21.6mm internal width rim, the Rutland at 30 psi measured out to be 41.3mm, and a 23mm wide rim should be pretty close to spec. Stay tuned as we put more miles on the Rutland in both 38mm and 42mm versions.